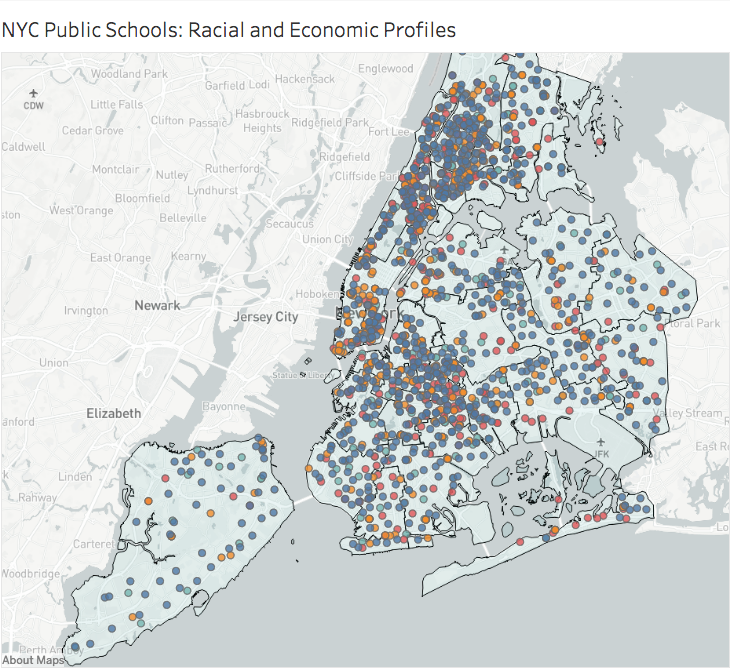 This map shows how every public school in NYC fares in relation to the city's diversity goals. See the interactive map on the Center for NYC Affairs website, http://www.centernyc.org. Earlier this month, the New York City Department of Education (DOE) released a long-awaited plan designed to increase diversity in the city’s public schools. Noteworthy in the plan are two numeric goals the DOE proposes to use as “yardsticks” to measure their progress. Outside observers have celebrated these goals as a “bona-fide breakthrough” and also criticized them for “aim[ing] too low.” But the plan itself lacks sufficient detail and context to make such evaluations. Reducing the number of “economically stratified” schools by 10 percent. We also created this interactive map showing the current status of 1,757 public schools in New York City in terms of these goals. While reaching these goals may well have significant impacts on the lives of individual students, achieving them will require little or no systemic changes to the city’s schools. No heavy lifting will be needed to meet them. First, as to racial representativeness: Currently, just under 70 percent of New York City public school students are black and Hispanic. Based on that, the DOE defines a racially representative school as one with between 50 percent and 90 percent black and Hispanic enrollment. Currently 502 of the city’s 1,757 schools, with enrollments of just less than one-third of all students, meet this definition. Over the past five years, there’s been a slow but steady climb in the number of students attending schools that meet this racial representativeness criteria. Since the 2011-12 school year, this number has grown by over 34,000 students – an annual rate of increase of about 2.4 percent. The reason: Modest increases in white and Asian enrollment citywide, and a small drop in black enrollment. If this increase were to continue at an only slightly higher annual 2.9 percent rate, about 10,000 students a year would find themselves in racially representative schools each year – an easy glide-path to hitting the DOE’s five-year racial representativeness goal. Second, as to economic stratification: DOE defines a school as economically stratified – that is, skewed toward students with either relatively low- or high-income student bodies – using an Economic Need Index (ENI) that is based on eligibility for public assistance, level of poverty in students’ home census tracts, and other factors. Currently, the average ENI for all schools citywide is 0.64; DOE considers a school economically stratified if it has an ENI 10 points above or below this average. In the school year just ending, 588 schools attended by some 35 percent of all students citywide already meet the DOE’s goal, having ENIs that fall within the 0.54-0.74 range. Just as with racial representativeness, what our research shows is that there’s already a steady, detectable increase in the number of schools entering this 0.54-0.74 grouping. Today, 44 more schools fall in this category than did just two years ago – an average growth rate of 4 percent per year. Going forward, the DOE could reach its “economic stratification” goal within five years even at a slightly lower 4.6 percent annual growth rate without having to make any changes to the status quo. Unfortunately, New York City’s public schools remain among the most racially and economically segregated in the nation. So while the DOE’s diversity plan is a step in the right direction, its goals are disappointingly cautious. The DOE’s leaders, and the School Diversity Advisory Group that DOE has established to help guide its diversity plan, should aim higher, both system-wide and also within the city’s community school districts. Just coasting along isn’t nearly good enough. Nicole Mader is a senior research fellow at the Center for New York City Affairs and a doctoral degree candidate in public and urban policy at the Milano School of Management, International Affairs, and Urban Policy at The New School. Ana Carla Sant’Anna Costa is a quantitative research assistant at the Center and a master’s degree candidate in nonprofit management at the Milano School. Katherine Safter helped with data analysis and visualization for this report. She is an education and political science major at Haverford College and a summer intern for InsideSchools.org and The Center for New York City Affairs.